The Congress of Southeast Asian Librarians (CONSAL) was established in 1970 in response to a growing sense of Southeast Asian identity among librarians and information professionals. CONSAL membership comprises the national library associations and the national libraries of the ASEAN countries, namely: Brunei Darussalam, Cambodia, Indonesia, Lao, Malaysia, Myanmar, Philippines, Singapore, Thailand and Vietnam. CONSAL convenes a General Conference triennially in each country in rotation. In behalf of the CONSAL XV Philippine Executive Board, we are pleased to invite you to attend the 2012 CONSAL XV General Conference on the theme "National Heritage: Preservation and Dissemination" to be held at Discovery Kartika Plaza Hotel, Kuta – Bali, Indonesia from May 28-31, 2012. This is one occasion for all librarians in Asia and other parts of the world to be together and share each other's experiences, knowledge and expertise. CONSAL General Conference Package is US$1,312.00 inclusive of the following: Registration Fee, Round trip economy class ticket via Singapore Airlines, Hotel accommodation for 5 days / 4 nights based on twin sharing, Round trip airport-hotel-airport transfers, Daily Buffet Breakfast, Airline tax, Conference Proceedings, Conference Bag, Conference Sessions, Lunches and Cultural/Farewell Dinner, Certificate of Participation/Attendance and Half-day City Tour. 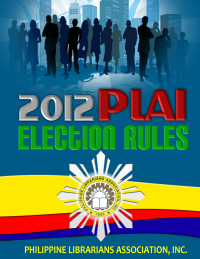 Payment in cash or in check should be payable to Philippine Librarians Association, Inc. (PLAI), CA No. 201-515864-3, PNB, T.M. Kalaw Branch, Ermita, Manila. A copy of Bank transfer should be fax to 5259401 or 9292180 or send to PLAI Headquarters, 3F Room 301, The National Library of the Philippines., T M Kalaw St., Ermita, Manila. Interested participants should deposit US$100 and full payment is on or before April 27, 2012. We look forward to seeing you in CONSAL XV (2012) and altogether reap the success of this event. Below is a copy of CONSAL XV General Conference Registration Form. - Deadline for registration is:27 April 2012. - Please complete using a typewriter or BLOCK LETTERS. Title: Prof. Dr. Mr. Mrs. Ms.
Payment in cash or in check should be payable to Philippine Librarians Association, Inc. (PLAI), CA No. 201-515864-3, PNB, T.M. Kalaw Branch. A copy of Bank transfer should be fax to 5259401 or 9292180 or send to PLAI Headquarters, 3/F Room 301, The National Library of the Philippines, T Kalaw St., Ermita, Manila. For cancellations received before 6 May 2012 an administration fee of USD 50 will be charged. For cancellations received after 6 May 2012 no refunds will be given. Delegates who cannot attend may, under certain conditions, name a substitute to take their registration. Please contact PLAI.